Three level 3 bedroom house plus sofa sleeper in lower level. From the moment you walk in the door you will know you made the right choice for your family vacation. This house is screaming Vacation Rental with Three levels of Lakeview living space equals three levels of open-air Lakeview Decks! This house affords your family the space to spread out not to mention the awesome covered dock with swim platform and walk in the water steps, that’s right no ladder! Three bedrooms, three and half baths with a sofa sleeper on the lower level allows sleeping for up to eight people in beds. There is also plenty of space for an air mattress in the upper level living room and in the lower level next to the sofa sleeper. The main / entry level of the house offers the kitchen, dining room, half bath, Master Suite appointed with a King Bed and private bathroom. The upper level includes the living room and the other two bedrooms, one of which has Two Twin Beds and the other has a Queen Bed. There is also a Jack & Jill Bathroom with a full tub between the two bedrooms. The lower level includes a queen sofa sleeper, wet bar and refrigerator, another Full Bath and is only a few steps away from the dock. All levels of this house include Lakeview balconies with a gas grill on the lower level. The deluxe covered Boat Dock offers a 12 X 30 Boat Slip, a PWC Slip, a very nice swim dock with walk in the water steps and a picnic table. 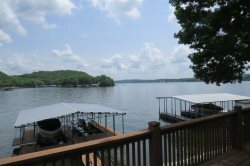 You can spend the entire day relaxing in the sun and floating in the lake as this house is located towards the back of a very large Lake of the Ozarks cove. Let’s talk location, this house is minuets away from the historic Bagnell Dam Strip, Baxter’s, Blue Heron and JB Hooks Restaurants. Located in the Four Seasons area of beautiful Lake of the Ozarks puts you minutes away from all the Lake Area Attractions. As you can see this house is perfect for your next Lake Vacation, you can book this house with confidence!